In celebration of the release of their debut full length album, "Stuck In New York City," The Vansaders will take the stage at Knitting Factory on Saturday, June 8, 2013, with special guests Old Monk, The Marshmallows and The Brooklyn What. 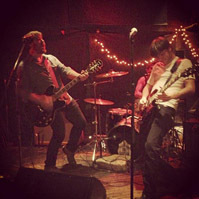 Combining Country, Classic Rock n� Roll and Punk influences, Doug, Mikey, Johnny, Marie and Robby, also known as The Vansaders, have drawn inspiration from greats like Johnny Cash and George Jones to create high energy songs about navigating their way in and around New York City. The band�s debut album �Stuck In New York City� will be available for purchase at the show. According to vocalist and guitarist for The Vansaders, Doug Zambon, "Stuck in New York City isn't a concept album, but was absolutely inspired from the first song to the last by the highs and lows of living in New York City," explains Doug. "Whether they are about going out partying or desperately needing a break from the amount of work and the craziness it can take to survive here, all the songs were born from situations where city life served as the backdrop to how the stories came about. We are really proud of the record, very excited to be joining Killing Horse Records, and love the Knitting Factory." Be sure to get to Knitting Factory by 8pm to catch performances from the band�s special guests. Depending on whom you ask, The Knitting Factory is a great spot to check out an upcoming band or Hip Hop artist for the first time or catch a comedy show usually accompanied by a live Dj. Located in the Williamsburg neighborhood of Brooklyn, Knitting Factory has a bar area separated by a soundproof glass distinguishing the live performance area from the bar area. Patrons have the option of paying to see a performance or just hanging out near the bar. The atmosphere is hipster friendly and the drinks are reasonably priced.